Christmas for Refugees programs held in four nations! (Amman Jordan – 12/19/17) Christmas for Refugees events celebrating the birth of Jesus have begun for 2017. Celebrations have already taken place in Nigeria, Lebanon and Iraq. 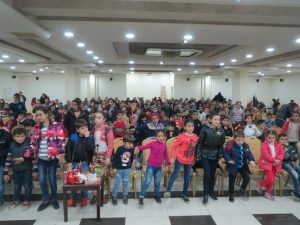 Displaced Christian children have come together to have fun, games, songs and gifts along with programs that center on the true meaning of Christmas. Every event is different for various cultural and geographical reasons. 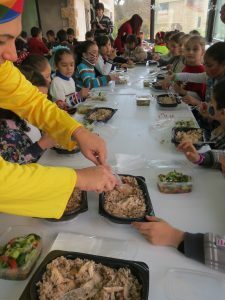 In Lebanon where as many as twelve different churches are involved, differences in the programs are often caused by the available facilities and how many children can be accommodated at one time. Regardless of the exact program, there is a strong emphasis on the real reason for Christmas, the birth of Jesus Christ the Lord. In northern Nigeria, an area that became Muslim majority only during the 20th century, Christians are cruelly persecuted, even those whose families have lived there for many generations. In Nigeria, the Christmas for Refugees program was held at an orphanage near Jos, a majority Christian town that has faced terror many times. Most of the children in the orphanage lost at least one, and often two parents to attacks by Muslim terrorist groups such as the Boko Haram. 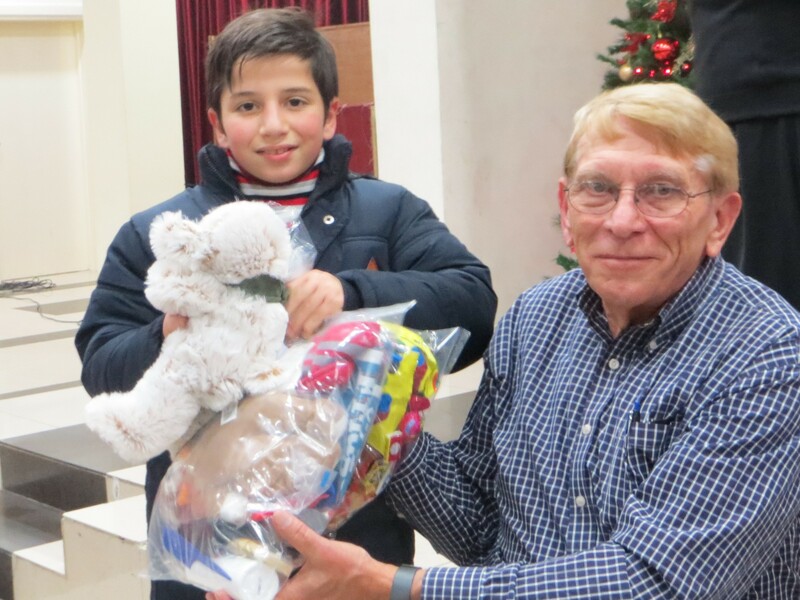 Volunteer assists one child with hot meal provided at Christmas for Refugees event. In Lebanon six of the twelve planned Christmas events have taken place and I have attended three of those. The churches involved and that will be involved are Baptist, Chaldean Catholic, Orthodox, Nazarene and non-denominational. Regardless of the denomination the program and expenses are approved by the service ministry that oversees the program for us in Lebanon. 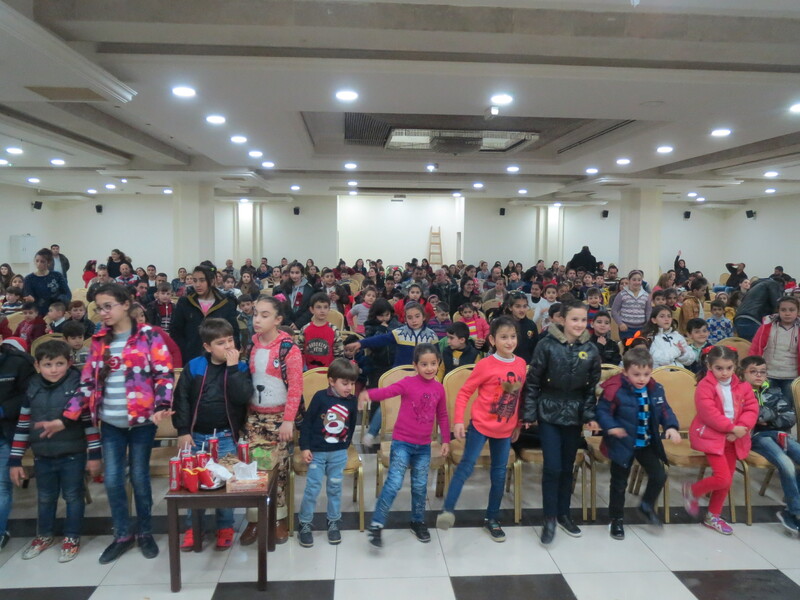 At one of the celebrations I attended in Lebanon, all 200 children stayed in the auditorium for songs, games and presentation of a Nativity play. In a church with more space the children were broken down into groups of ten so they could move from one game to the other set up by the church. There were games such as ring toss and bounce a Ping-Pong ball into a glass of water. There were also art stations to make Christmas ornaments and angel figurines. In Lebanon each child received a meal and a toy, usually a board game that could be shared at home, or Gospel themed coloring and work books. The families received double thick blankets. The blankets were manufactured in Lebanon by a non-profit organization made up of Syrian refugees. In Iraq all programs are operated by the youth ministry of our affiliate ministry and not by the church. In an area as devastated as the Nineveh Plain, the churches have not recovered and do not have the infrastructure to operate a Christmas program for hundreds of children. The Christmas for Refugees program is more about hope than food and games. These Christian children for the most part were in middle class homes. Their families were driven from those homes and the houses were looted. The Islamic State stole everything, even baby toys, and transported them to Turkey to sell to obtain funds for their terror operations. As the Islamic State was forced to retreat in Iraq and Syria, many of the homes of Christians were burned or blown up. Churches were specially targeted and the dead in nearby cemeteries were dug up and their bones scattered. Most of the children have not been to school for at least two years, and many of the Syrian children who escaped to Jordan and Lebanon have not been to school for as much as six years. The children are without hope, having lost all including in some cases either one or both parents. Please support Christmas for Refugees. Donate today!